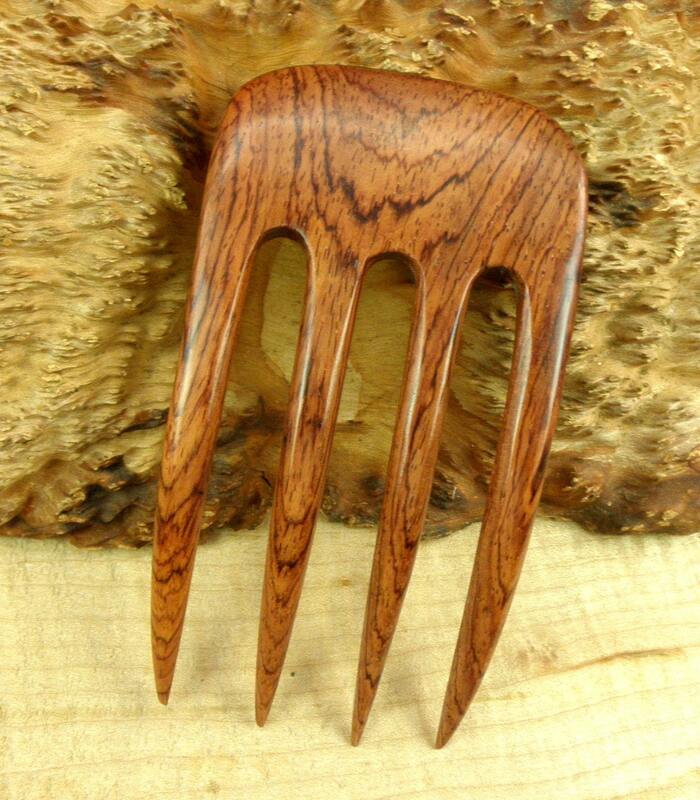 The 4 7/8 Inch Laos Rosewood Hair Fork is curved to fit the contour of your head and can be used from several angles. 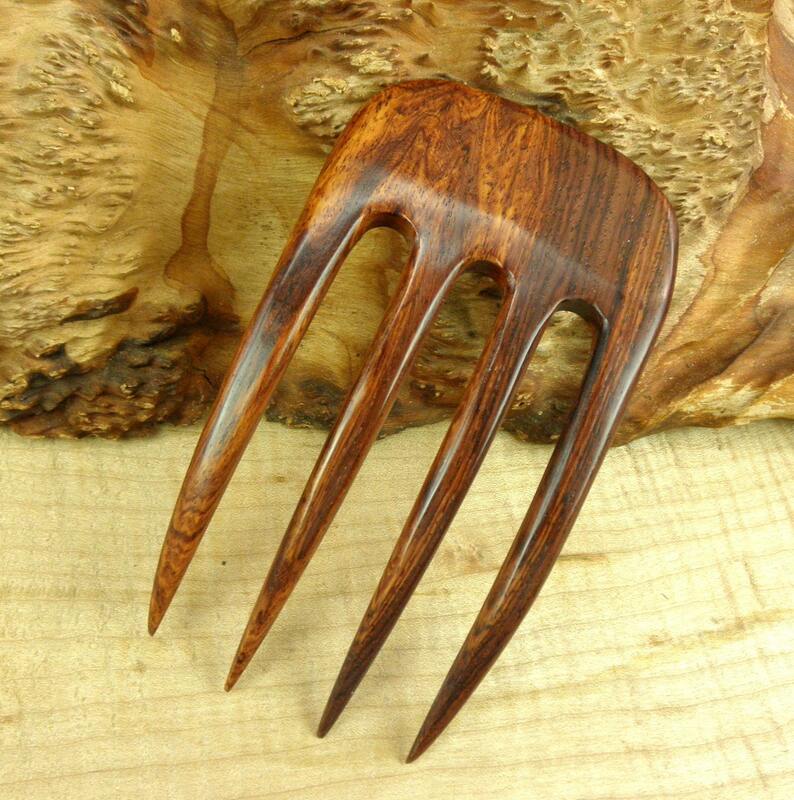 This Curved Laos Rosewood Four Prong Fork is a "Rustic Heavy Duty " hair fork I have added to my line for the customer with Thick Hair that needs a super strong Hair Fork with great holding power. It is 2 5/8" wide; 4 7/8" long and 1/4" thick. The pictures do not do justice to this Hair Fork. This Hair Fork is not for those with Light, thin hair as the forks are wider apart then my regular Rosewood Hair Fork. The Functional Prong Length (FPL) is 3 5/8" for this 4-Prong Hair Fork and varies within 1/4" from piece to piece. This Laos Rosewood (Dalbergia Sp) is very heavy and hard. The color is a deep red with blackish grain streaks running through the wood. The color range can run from a pinkish hue up to a dark red almost a purple. 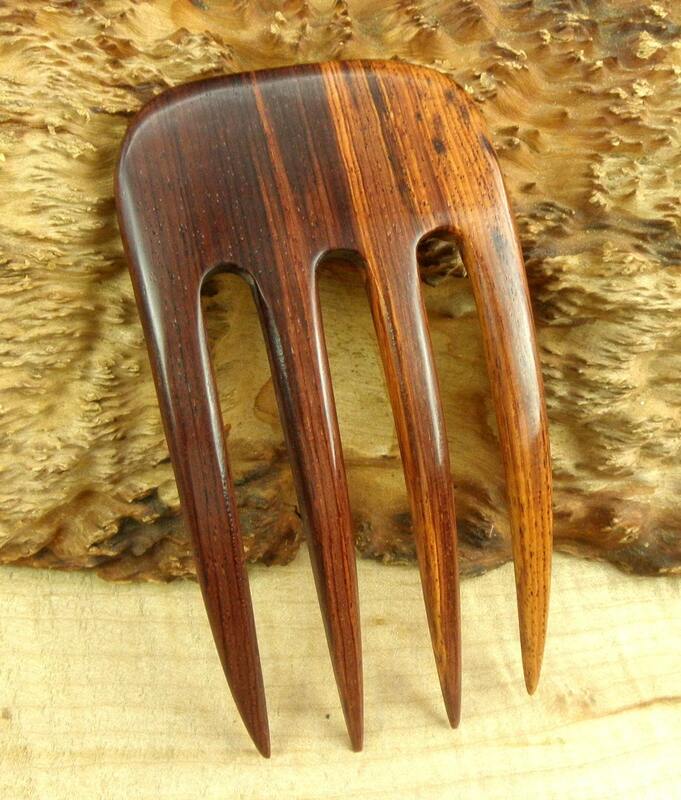 These Hair forks are being made out of Laos Rosewood and/or Striped Ebony so there are twelve different listings here on Etsy . 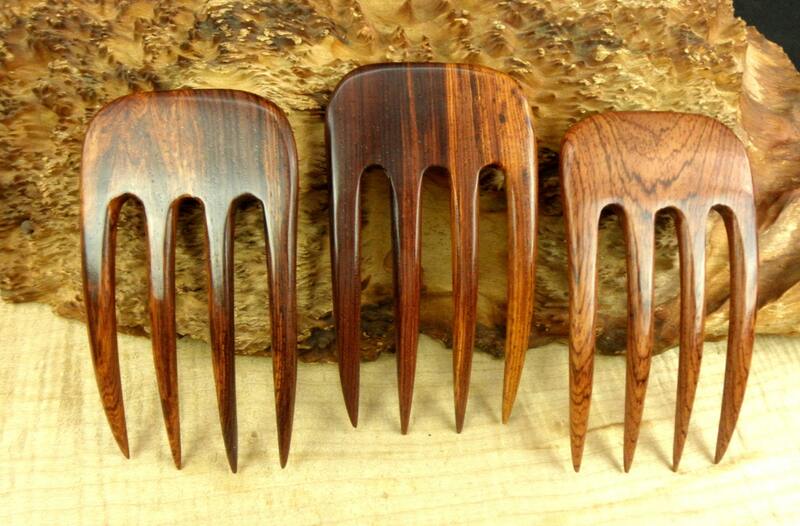 All of these forks are made of these heavy duty wood species and are very strong and hard. These "Rustic" hair forks all have their prongs spaced about 1/2" apart where my regular two and three prong forks are not spaced any greater than 3/8" apart. This is a negative for customers with very light, thin hair and I do not recommend these forks for them. The Hair Forks are finished with a lacquer coating and rubbed out to a semi-gloss finish and waxed with Johnson Paste wax. These are intended for the customer that has thick hair, and plenty of it !! If this is you try one of these and if it doesn't work for you return it for a full refund. 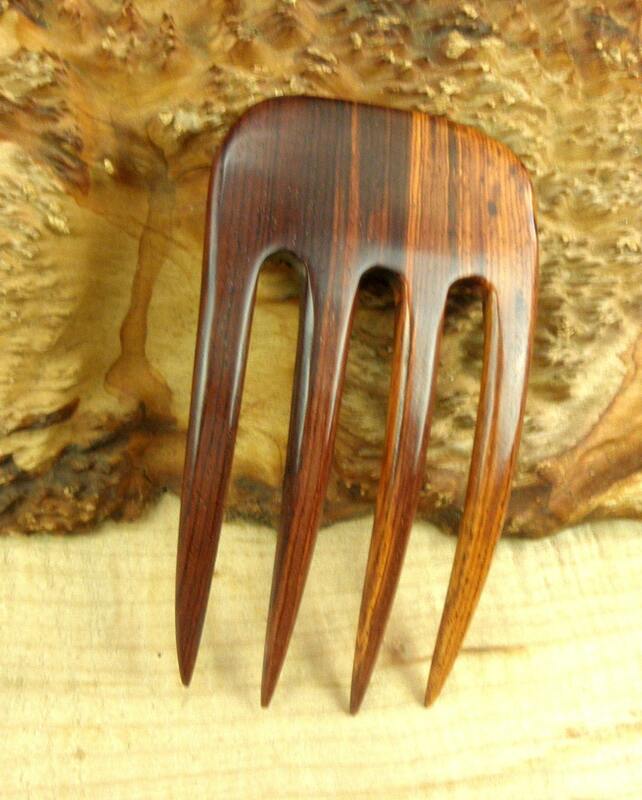 The last picture shows several different colors and grain patterns and is just to show the variety that this Hair Fork may come in. The listing is for only one Hair Fork. As a matter of caution some of the Forks will be sharper then some people like and I therefore recommend that you blunt the tip with an emery board to the degree of sharpness you want. Another fantastic fork from this artist. This has a slight curve that works really well for the length. Its very light yet still makes a statement. The tine spacing and shape is perfect for my length hair (waist). These were shipped lighting speed and got all the way across the country to me in no time at all. Beautiful fork, nice and smooth. Arrived quickly. Jim is great to deal with.